They have 20 times the resolution of regular scales. 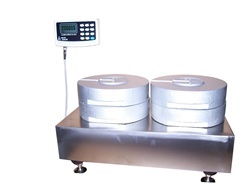 On top of these high precision capabilities, our scales feature easy to see digits on a large LCD display, so there’s no guessing on the measurement. It will come with a zero function and the ability to weigh in many different units of measurement; can perform zero tracking, parts counting, and stability control. We can also enable it to transmit data wirelessly to a company computer or even to a printer so that you don’t have to double your work when recording weights. If you need a rugged, high precision scale that will stand up to years of industrial use and complete weighing tasks that will save you time and money, contact ArlynScales today.